I am eating in a restorant, outside, in the street. I finish and going to pay upstairs. When I arrive I notice that my wallet is in my jacket, downstairs. So, I got off and see a lot of people around my jacked. Then an unknown girl take my wallet and get out. I run after her, but I arrive in a place where the air is unkown. It ripple like the waves in the ocean. even I see some fishes within. I explain it this way: There is here a great intensity of the electromagnetic field that cause the air ripple like the ocean. And among the properties of this air, you can swim underwater like you were in the sea, but with the main feature of the air: you can breath it like was the real air. Comments: I forget the unknow girl -- the anima -- when I arrived in this strange place. This seem an obvious conjuntion between the air and the liquid. As an alchemycal simbol I look after in the index of mysterium conjuntionis and find that was a synonym for the aqua permanens, aqua mercuriales or the spiritus mercurialis. The place where you make the lapis or even the lapis itself. I not try to read and understand the totality of this book of another time and no time itself as really is. It's too soon, but I see that is not the first dream where I see alchemycal symbols and I know that I go there in the future, but it's soon, as I am studing systematically the work of CG Jung and I am into symbols of transformation. Later I begin to think in the spiritus mercuriales. I clearly see that was a not differenciate form of the pair anima-animus, so I think of him as a hierosgamos of the feminity side with the masculinity of the life. So I look after mercurius hermafrodite in the index again and also find it!! So my intuition is right. Then I remember the place of Mercurius-Hermes as a messenger of Gods, and also as the guide of the souls of the deads to the Hades. (this is an image of the roll of the anima in men as a guide (psicopompo) of the Unconscious I also remember his personality as good and bad, as helper, but also as astute and raver. This is in consonance with his place in alchemy as a guide to the lapis but also as a distant spirit that is not helful but playfull that serves to him only and got happy with your desperation. Only helps you when you merit it. I have no association for the people around my jacked or why i have to going upstars to pay the bill. The figure of the thief is common in the dreams of my life evolution, since it mean the strange and future egos that were not prepared at present to arrive the consciensce. The thief blocks you to go to your current place (your usuall life) and show you a change in your life. But is the first time that the anima plays this rolle. Thats the main asociations of the dream. The high intensity of the electromagnetic field seems me a contamination of the consciousness trying to explain the inexplicable, as a science approuch to the unknow, as some theories of the rare evens of the enchanted houses are explained for the high intensities of the EM field. I know that there is more, so I ask for ideas. 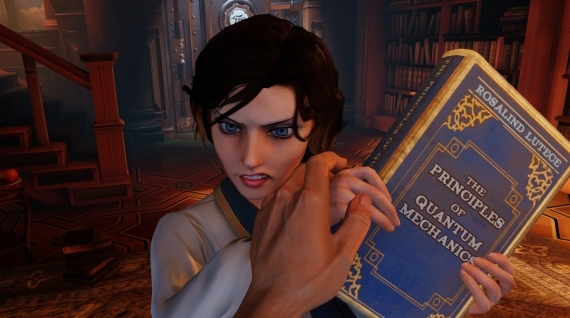 That night, I dreamed that I liked the video game "Bioshock infinite" (I have not played this game yet) And there are some similarities with your dream: Water, air and anima. The first Bioshock took place in Rapture, an underwater city and "Bioshock infinite" takes place in Columbia, the "floating city" located in the air. The central character of the game seems to be Elizabeth, a fascinating anima. I am eating in a restaurant, outside, on the street. I finish and go to pay upstairs. When I arrive I notice that my wallet is in my jacket, downstairs. So, I return and see a lot of people around my jacket. Then an unknown girl takes my wallet and leaves. I run after her, but I arrive in a place where the air is strange. It ripples like the waves in the ocean. I even see some fishes within. I explain it this way: There is here a great intensity of the electromagnetic field that causes the air to ripple like the ocean. And among the properties of this air, you can swim underwater like you were in the sea, but with the main feature of the air: you can breathe it like was the real air. Sergio, welcome to the unus mundus forum. In your dream quoted above I took the liberty to correct some spelling and English grammar errors so when I studied it I wasn’t distracted by these little things. I see from your profile that you are into the hard sciences and like this most likely your superior function would be thinking. Since 85% of dreams are compensatory one can generally conclude that the dream comes to compensate for some one-sidedness in your psychological adaptation. On reading your dream I had the following reactions. Not knowing very much about you I hesitate to say the following would be the way you should understand your dream. So let us say it is the way Gregory would look at this dream if it were his own. Like this perhaps it gives you some of those further ideas you asked for in your post. At our time in history the apocalypse archetype is highly constellated. It derives its energy from the loooong shadow cast by the unfolding of the Christian archetype (Logos ego functioning) which necessarily demonized what it was trying to distinguish itself from – to untangle itself from (Eros ego functioning). In this case thinking must separate itself from feeling. Another way this could be said is that the masculine principle had to separate itself from the feminine principle so that intellectual reasoning could be integrated. Remo’s opus has clearly shown that there are two centers of “knowing” – the Logos or gray matter brain the Christian archetype was committed to explore and the belly brain, the gut brain in which there are more neurons than in the gray matter brain. How to explore the latter center of knowing is discussed in his writings. Quite simply it is the need to enter the water chakra, the 2nd chakra in the subtle body. This is presented as the need to dim the Logos when meditating – like this one psychologically becomes wave like in their consciousness not particle like when in the Logos. Your physics background should resonate with this fundamental behavior of light. Light has always been connected with consciousness so it seems in our time we need to explore its wave-like realm of potential being by entering into a practice of passive meditation. The Logos will come into play later when recording your visions, dreams, sensations, etc. Your primary dream image can now be discussed in the context of the above reflections. It helps to explain the strange union of air & water aspects in your dream – it is as if the head is in the belly. It’s the union of fire and water in alchemical terms and has features of both because the mixture is breathable and at the same time is wave like; it is neither and both – it is an intermediate realm - it is an image for the excluded third which unites the opposites. It even contains fishes which would represent unconscious factors in the unconscious of which the dreamer needs to become conscious. The young lady thus represents the feminine principle that would like more attention. She steals your wallet (where one usually keeps important identification like a driver’s license – and money which in the economy of the psyche is psychic energy). It is like saying “identify with me, give me some of your psychic energy by entering passive meditation”. In my material this was imaged using circularly polarized light as shown in the following animation. It is an image for the masculine principle mind-melding with the feminine principle. (Note: they are at a 90 degree angle to each other. In cosmology the hidden dimensions are postulated to be orthogonal to spacetime.) Like this one becomes a wave function that does not collapse and become particle like. The collapse of this wave function could be thought of as suddenly seeing an image appear in the blackness on the inner screen, or of hearing a voice, experiencing a sensation in your physical body. Being a good scribe and recording all such information will build up a story of these seemingly disparate fragments that will eventually be stitched together with further data accumulated in this same process. You pay for your meal by having to ascend a flight of stairs – this means you can assimilate into your own subtle body stuff the meal of this dream by climbing to a higher consciousness – a long and difficult task. In our time in history “the way down is the way up” – something that came up as an impression on my consciousness in the mid 1980’s. It seems to be the thrust of Fox’s post just above when he shared the trailer to BioShock. We are too high up in the air. We need to return to the Earth – to the feminine principle and learn from that source of Wisdom. Thanks you, Gregory and Fox for your commentaries. I know this dream has deeper thoughts about deeper things and it's not only me who is dreaming conjuntions. The long and complete post of Gregory, as almost every one I see, are far away of my immediate understanding. It doesn't mean that I don't understanding him, but I know he has written many things new to me and it demand of a long process of working to became immediate conceps to me. I can say you the same M-L von Franz say Jung the first time they met: "I will need about ten years to understand all of this" -in other words, to be familiar with this new conceps and connect them one with others. Yesterday it was the first session of analysis with a jungian analist and hope that I would learn many things about the deeper psycology and myself and this could complement my own readings and reflections. It’s the union of fire and water in alchemical terms and has features of both because the mixture is breathable and at the same time is wave like; it is neither and both – it is an intermediate realm - it is an image for the excluded third which unites the opposites. It even contains fishes which would represent unconscious factors in the unconscious of which the dreamer needs to become conscious. Yesterday I told her that I always thought in the oppsites and how to joint them, and she said: "not, not is synthesis, it' s to find a third way" - that makes me think more. You said: In this case thinking must separate itself from feeling. Another way this could be said is that the masculine principle had to separate itself from the feminine principle so that intellectual reasoning could be integrated. It's too much for me in this moment, but I will finish this view of the unus mundus because is my image of the wholeness that I have to complete. Father time runs and the portal of the anima is open and invited me to enter. Step after step. What I am trying to say is that only when the archetype is activated with libido the image appear in the conscience: sometimes is a dream, sometimes is a vision, sometimes is the intuition. One can say: the archetype has an amount of energy that let him appears when he needs to do it, but when an archetype doesn't appear forming images, is like the archetype doesn't exists. Only you need one archetype: the self, always active. The others are partial views of the Self. In the self you can not speak of libido or Form, it's the same, it's inconseivable. You need other ways to access God, or easier than this: you will be guideed by the Self, expressing himself as partial Form (archetype) and the libido needed to became visible, so you got an uncosncious appearance, suddenly from the blackness of the mind. The archetype of God, the Form of God is the conjuntio of the opposites, Jung said, but inside every concept in the psyque there is always a conjuntio between the Form and the libido in order to make it expressed, in order than the matter and physic energy in the visible universe can be exist. Very difficult to explain the intuition I have, very very difficult. Glad to "hear" you begin analysis. Every journey begins with the first step. And then as you say it is "step by step". P.S. What was the approximate age of the girl that stole your wallet? The day before this dream I dealt with the Sapientia Dei or Sophia (to me equivalent to the World Soul). I read in CW 11, § 624 that she is the "master workman" (Werkmeisterin in German, thus feminine: "master workwoman"), who "realizes God's thoughts by clothing them in material form, which is the prerogative of all feminine beings." Then, in §§ 711, Jung tells us that after the destruction of Jerusalem in the Apocalypse "the descent of the heavenly bride, Jerusalem, an equivalent to Sophia [happens]," and that this "is all part of the heavenly hieros gamos [= coniunctio; = Holy Wedding], whose fruit is a divine man-child." Thus, it is Sophia/Sapientia Dei/the World Soul that comes down to earth at the end of the times. .
Sergio - I like your intuitive explaination of the dream - it appears to flow smoothly - "intuitively" - as if you have an ability for it. This dream brings to my mind Mircea Eliade's writing on shamanism and some Hindu characteristics - as the Hindu phrase to make a holy man take away his holy object, which might be considered the wallet, talisman of the external life. Indeed, Anima takes it from you and leads you into a new world of richness and you can only get there naked and alone and without your wallet. The anthropologists say the shaman descends into the earth (" . . . he descended into Hell") and then to the sky (" . . . he ascended into Heaven") as Santa descends the chimney and then rises to the sky on magical reindeer. The shaman has then entered the realms yin and yang and like the boddisatva comes back to the world in the middle transformed. And similar to Lennon shaman's journey (and Dante's) following Amina (Lucy) to the sky with the same magical qualities as you see in this dream (" . . .plasticene porters and looking-glass eyes."). So possibly you are experiencing a similar transformation. . . . likewise the old jacket is left behind as snake sheds skin as Krhishna sheds his old body for a new "dance of creation of life and death." This picture (with C.G. top row center, next to Edgar Allen Poe) shows the sheding of skin, jacket, old body as The Beatles rose to creative heights and left their Old Bodies behind as Madame Tussauds wax figures. She is a blonde young girl, you can think of her like being 28-35 years old. The anima always appears to me like a blonde young girl. It's very interesting: Sapientia dei or Sophia, the master workwoman who realizes God's thoughts by clothing them in material form, which is the prerogative of all feminine beings I have to think in it. Maybe is the one I am looking up for developing my intuition about matter, energy and Form-archetype united in the Self. Sergio - I like your intuitive explaination of the dream - it appears to flow smoothly - "intuitively" - as if you have an ability for it. Years ago when one idea gave me some light in my thoughts I try to develop that deep and small light letting my mind to express itself in my thoughts. Nowdays I see that ability is the intuition. One can develop it; only need to be patien, concetrated, waiting to the idea that will come from the darkness. The intuition usually is rigth because is not the finite person who talks, but the Unconscious. I remember the first time I hear the word in the context of the Jungian works. It make me smail. I thought: "That is like magic. Nonsenses!" - well, I don't want to say is magic, but something magical seems that the Self talks us in dreams. If no magical, very special is. And lucky for us to know it. This dream brings to my mind Mircea Eliade's writing on shamanism and some Hindu characteristics - as the Hindu phrase to make a holy man take away his holy object, which might be considered the wallet, talisman of the external life. Indeed, Anima takes it from you and leads you into a new world of richness and you can only get there naked and alone and without your wallet. Yes, you are right. Gregory say the same. The anima gives no usual money or identification, like the one you have in your wallet. It remains me: "The gold we look for is not the ignorants gold" - or something like that Alchemyst said. It's another kind... spiritual gold, spiritual knowledge. In the case of a man, maybe femenine knowledge, that deeper and dark side of life. The anthropologists say the shaman descends into the earth (" . . . he descended into Hell") and then to the sky (" . . . he ascended into Heaven") as Santa descends the chimney and then rises to the sky on magical reindeer. The shaman has then entered the realms yin and yang and like the boddisatva comes back to the world in the middle transformed. And similar to Lennon shaman's journey (and Dante's) following Amina (Lucy) to the sky with the same magical qualities as you see in this dream (" . . .plasticene porters and looking-glass eyes."). So possibly you are experiencing a similar transformation. . . . likewise the old jacket is left behind as snake sheds skin as Krhishna sheds his old body for a new "dance of creation of life and death." Yes, yes, very good comparison. 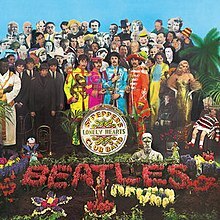 I never thougth so symbolic was that cover of the beatles. Well said. She has an strong attraction and even maybe I'd rest like The Fool on the Hill for the rest of my life, in this Long and Winding Road, I have to enter in her realm. Speaking of holy objects, I notice today that 100 sherpas attacked western climbers on Mount Everest. Are the sherpas taking back their holy mountain? As an introvert, I have always identified with the sherpas one, because when I was young I had delightful friendships with peasants in northern Thailand, a Mekong culture (Mekong has its source in the Himalayas), and my ancestor unfortunately was involved in the famous British slaughter of 800 Tibetan monks and I've been involved in Buddhism since Thailand (1967-68). In all cultures climbing the mountain is finding the path to God but this is not our (western) mountain and was instead not a action of spiritual or psychological maturity or transcendence (in that, the "real" mountain is not a real mountain) but a representative action - a profanely symbolic spirit act - of conquest in the end game of western imperialism. A meaningful insight about the early days of your life, Bernie. Your identification with the younger days friends representatives of a culture that was slaughtered by your ancestors. Of course the climb of a mountain is a conquest for the western way of life. Maybe the sherpas are seeing climbing their holy mountain as a conquest too, as happens with the usual corruption of westerns in other areas of the earth. The only positive thing is the desire to overcome difficulties. Sure a different way in the approximation of the experience of God. And as the knowledge of God can be dangerous as an isolation of the rest of the society or as an inflation of the ego (the problem of Belerofonte in the greek mythology) you see that the western see of life is an inflation of the conscience that so bad conssequences had have in the modern history: the lost of the inner life, the inner experience of God. So the sherpas and their culture could be in risk of losting their inner meaning of the Everest Mountain. Maybe, if you let me said this, you felt in younger days this risk of losting your inner life owing to your occidental needs or behavior.